Portland now has three or four festivals that beer geeks consider must-see events, but putting one atop the list would be hard work. With one very major caveat, the Holiday Ale Fest may now be in the driver's seat. At no other fest do breweries send such rare, limited-release beers. Barrel aging is now the norm, and some of these have been treated to months of care. Beers come mainly from the West Coast, but the Fest manages a few international classics, as well. Add to that the special tastings that include vintage beers and you have Beervana's most concentrated collection of fine beer of the year. The caveat: until organizers figure out how to fold space into inter-dimensional pockets, the size of the venue (Pioneer Courthouse Square) is not adequate to manage the size of the crowd. Last year they eked out a bit more space by adding an upper level, but it was still insanely busy. That upper tier returns this year, along with the expanded days, so you might find a time and place to enjoy a relatively peaceful pour. Friday and Saturday nights? Not so much. While barleywines and winter warmers are a regular feature, we have a couple of interesting trends this year. Porters and stouts are making a serious showing. This is excellent news, for they are ideally suited for the Portland winter months. In particular, there are three Baltic porters, four imperial stouts, and four flavored stouts (plus a flavored porter). I don't know if this counts as a trend or not, but there are four abbey ales. Experimentation with Belgian-inspired beers, mainly in the form of Upright and Cascade, continues apace. Stouts. Perhaps my fave style, and I may not drink anything else. (Not true.) In order, these are the ones that call to me: Bear Republic Baba Yaga, an imperial stout aged in cabernet barrels, MacTarnahan's Chocolate Imperial, not exactly imperial strength, but featuring chocolate nibs and oats, Ninkasi Unconventionale, a tarragon, lavender, and heather-spiced imperial. Cascade Sang Noir. An absurd mixture of vintages, mixtures, and barrels, with a few bing cherries for good measure. Only available at the fest. Baltic Porters. Perhaps my fave style. Wait... Anyway, three here, but depending on which booth I arrive at first, I'll be trying either Laurelwood's Polska Porter (10%!) or Hopworks' Kronan the Barbarian. Block 15 Oaked Saint Nick. An old ale aged in toasted American oak and dry-hopped with Mt. Hoods. Hair of the Dog JIM, 2009 vintage. A blended ale brewed only for the fest. Fort George North III. I am drawn to the diced sugar plums added to this trippel, but I fear it might be overhopped (99 IBUs). Still. 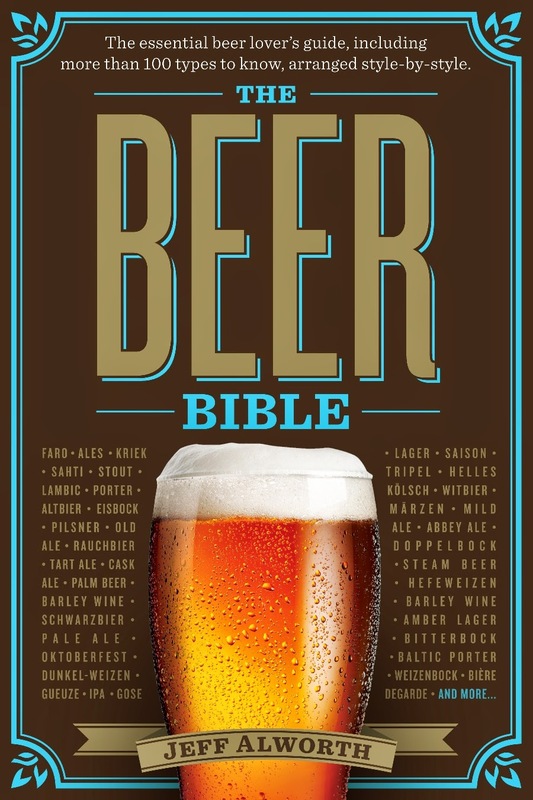 No doubt this will not form a complete list, but it's my target starting beers. Also of note, I've had the Dupont Avec Les Bons Voeux in the past, and it's amazing. Spend the two tokens if you've never had it. Again, you know what you like. Still, I should draw your attention to a couple of stand-outs. 2007 was the year Hair of the Dog first released JIM, and it was an exceptional beer. Just one keg of this vintage remains, and it will be tapped at 2pm on Wednesday. Also in that time slot, the Fest's oldest beer, a 2003 Old Knucklehead (BridgePort) and a 2005 Samichlaus. At 5:30, they'll tap a 2007 Scaldis Noel. I don't know what this beer tastes like aged, but it's sublime when they release it. Probably worth a couple tickets to find out. If you're around at 11 the next morning, you might watch Bayern tap its wooden cask of Face Plant with a wood hammer and spigot. But for beer (not to say that Face Plant, a weizenbock, won't be delicious), I'd try the Kona Da Grind Kona Coffee Imperial Stout. At 5:30, they'll tap Lompoc's Bourbon-barrel Aged Pagen Porter, which looks tasty. They'll do special tastings Friday and Saturday, too, but they haven't yet released the line-up. Check in on their Twitter feed or Facebook page for updates. I will be at the Fest on Wednesday for a blogger tasting, and I'll report back my findings. I'll go one other time with friends, too--probably Saturday. Reports as I have them, plus I'll guide you to other news/reviews as I see them. Cheers! A controversial Scottish brewery has launched what it described as the world's strongest beer - with a 32% alcohol content. Tactical Nuclear Penguin has been unveiled by BrewDog of Fraserburgh. BrewDog was previously branded irresponsible for an 18.2% beer called Tokyo, which it then followed with a low alcohol beer called Nanny State. Managing director James Watt said a limited supply of Tactical Nuclear Penguin would be sold for £30 each. On the other hand, the Mt. Carmel Brewing Company, which is based in Cincinnati, is focusing on its local market, where demand has outstripped the supply this tiny brewery can produce. I have long wondered about these models, and this may bear some closer scrutiny--is one model better than the other, and does it matter where the brewery is located? Alchemy is brewing up a sensational lineup of old and new world beers and artisan meats that will be crafted and served at our SE Portland location. Our unfiltered beers will be brewed with organic ingredients and expertly aged by veteran local brewers. Alchemy beer will be available in-house, to-go, and off-premise at fine local establishments. Yet another brewery to be thankful for! 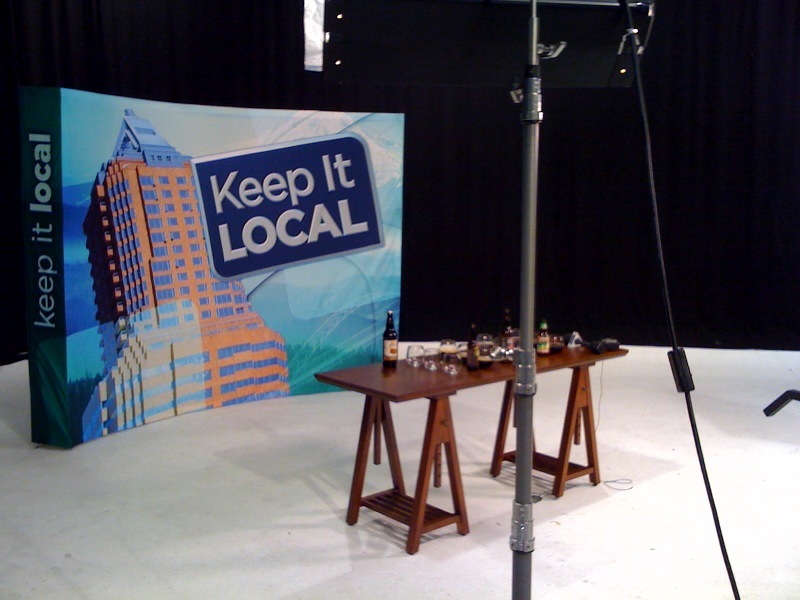 At long last, here's the segment on winter ales from KOIN's "Keep it Local." My gaffes were limited to staring at my shoes at the start (my, isn't Jeff bald!) and totally blanking out on what an alt was. KOIN, unfortunately, has gaffed by cutting this clip short--and leaving off most of the Oakshire tasting. Sorry Matt! Those of which I am particularly thankful. An Oregon winery made a bit of a splash yesterday when its riesling was featured at the huge White House gala with Indian Prime Minister Manmohan Singh. * (Not only because it was a local wine, but because the official menu misspelled "Willamette." D'oh!) Cool beans for the Brooks Winery, yet another in a fairly long list of local wines to be served at the White House. But we voted for change! Wine is so passe--hasn't the President (noted beer drinker) gotten the message that ales are the new pinot? The next time the White House throws a chichi fete--say when Angela Merkel visits--Obama ought to take bold leadership and serve beer. As a way of showing the way, let's have a look at last night's menu and see how we might have paired the courses with food. Course: Potato and eggplant salad, White House arugala with onion vinaigrette. Pairing: I'd choose something with a bit of sweet malt to contrast the tartness of the vinaigrette and the bitter/spiciness of the arugala. You want something light, though, so it will draw out the flavors and not overwhelm them. How about a nice pale ale. Since Obama likes to play the high/low card, let's go with Caldera Pale Ale, in the can. Pairing: "Fresh cheese" doesn't give us much to go on, but let's guess that this is a slightly heartier course. When I hear "cheese," I think Belgian, so we could suggest something like Upright Four or--since we're highlighting the nation, not just Beervana--New Belgium Dandelion Ale. Course: Roasted potato dumplings with tomato chutney, chick peas, and okra or green curry prawns, caramelized salsify with smoked collard greens, and coconut aged basmati. Pairing: In honor of India, the White House has made a variation on traditional Indian food. The pairing here is obvious--it needs to be a light lager, typical of the Subcontinent. I've recently had US-brewed Kingfisher, a classic Indian brand, and it's a great beer. Unlike its Indian version, the US recipe is quite nicely hopped, sharp, clean, and dry. It would go perfectly with the meal and be a nice show of international cooperation. Pairing: This seasonally-appropriate dessert calls for a seasonally-appropriate beer. To draw out the darker, earthier notes from the pumpkin pie, and to help cut the sweet, I would choose a dark dry beer here. One of America's finest is Anchor porter--a fine note on which to end a meal. Someone alert the President about this, will you? *Errata to file under "small world." The Beeronomist--he doesn't want us to call him that, but some titles stick, and in Beervana it's an honorific, anyway--once met the Prime Minister, back when he was just a technocrat in the Rao government during the Clinton days. Singh is, you see, an economist by training, and so they have a professional connection. 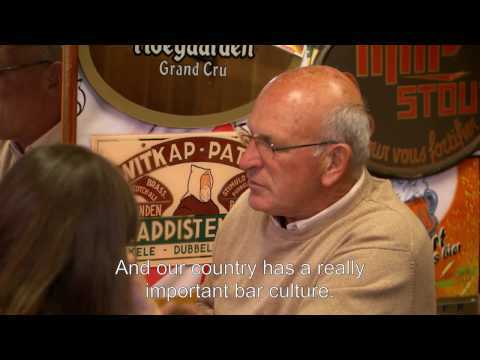 Beer and politics? Sidelights. But I can forgive Ninkasi their musical tastes. Beer, they say, unites all. Sleigh'r is, unexpectedly, a double alt. Ninkasi, like--well, like a heavy metal band--tends to stick to a narrow range of beers. The Ninkasi standard is an ale, large, loud, and muscular. They have dab bled in variants before--Schwag, for example. Sleigh'r is in this mode, a fun one-off. I have to confess, I judged this beer by its label. I didn't expect much, yet it was absolutely gorgeous pouring out. You think it's chestnut brown until you hold it up to the light and see the Christmas cranberry. It produces a lush, rich head and gives off a wonderful malty nose. In the end, it's a pretty straightforward interpretation of style (which also caught me off guard). The malt body is rich and clean, and there are nicely insistent hops. They're not showy or funky, just assertive, as you'd hope for in an alt. Overall, very nicely done. I'd give this a B+. Portland beer drinkers spend so much time talking about ourselves (I'm allowed--I have a blog) that it's interesting to get the perspective of visitors. Today's report comes from John Dodge, writing for The Olympian. On Friday night we crossed the Willamette River to the Hawthorne neighborhood in southeast Portland for some more pub crawling. This neighborhood has a weathered, counterculture feel to it, typified by the Lucky Labrador brew pub housed in an old roofing and sheet metal warehouse. The pub fare – spicy peanut curry over chicken, rice and vegetables – was savory, and the Dog Day IPA was hoppy enough for my taste. He got some bad service at Roots, which led to a scathing dismissal--proof that even one bad evening can affect a pub. Tomorrow I will be filming a shot segment for the show "Keep It Local," which airs daily at 4pm on KOIN TV. We will be tasting winter beers, four or five, of which I have three identified. Don't know if it will air on Tuesday, but it conceivably could. For those of you with the fortune to be near a TV set at four, tune in--if only to see how many gaffes I commit. I'll do my best to track down the video for those who can't watch at that hour. And on that note--have a fine weekend! 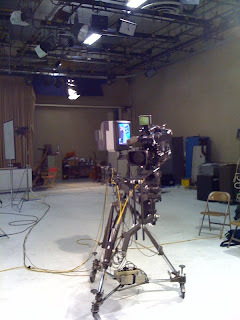 In prep for my media appearance next week (you like how I'm trying to pique interest here? ), I blind-tasted three winter warmers last night. 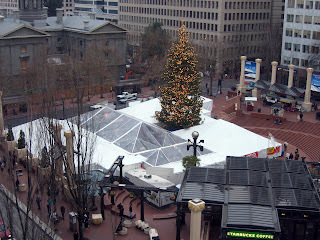 I figure we need to do one pretty traditional NW winter warmer. This was really one of the first sophisticated beer styles to achieve fruition, and I have always loved the season's beers as a result. All beers are roughly the same color—dark, amber highlights, off-white heads. Of the three, beer one is more straight brown, beer two redder but lighter, beer three red but darker. Mild aroma, tiny yeast quality, tiny hops. Flavor—extremely creamy and rich. Lovely. On the sweet side, but the hops keep it in balance, perhaps fading just a touch green and sharp at the end. Could use a bit more age. Frothy. Malt is candyish. Quaffable, comforting. Frothy head with batter-like head of mixed size bubbles. Sweet, cola-like aroma with just a bit of orange zest. Another very creamy beer, but with a lush hop character--though without bitterness. Earthy, and the cola in the aroma comes across in the palate as a beguiling rooty note. As the beer warms, it strengthens as the hops open up. Tight head of slightly darker color. Again, sweet malt in the nose, but roasty. Palate is likewise roasty. A malty beer with character nodding in the direction of a dry stout. Has a more substantial body. Very nicely balanced; the roast doesn’t overwhelm. At the end you arrive at a tripartite malty sweet, hop bitter, and roastyharmony. All three beers were great. I was able to guess pretty easily that beer three was Vinter Varmer, a beer characterized by its roastiness. 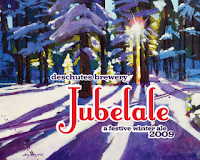 Jubelale and Wassail have always been brothers from another mother--so close, so lovely, two of my very favorite beers of all time. 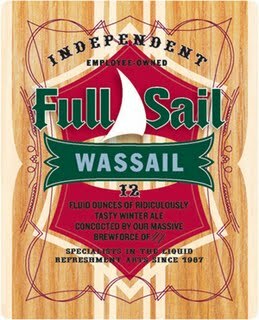 I guessed that beer two, with its lush hop character and sweet body was Deschutes, while the more assertively hopped, sharper beer one was Wassail, from hop-loving Full Sail. Turns out I was correct. Although I like all three, as they warmed up, the Jubel really began to sing. It has always been a crowd-pleaser, and it's because the profile is so approachable. There's nary a hard edge here--it's like a hot chocolate on a cold day. 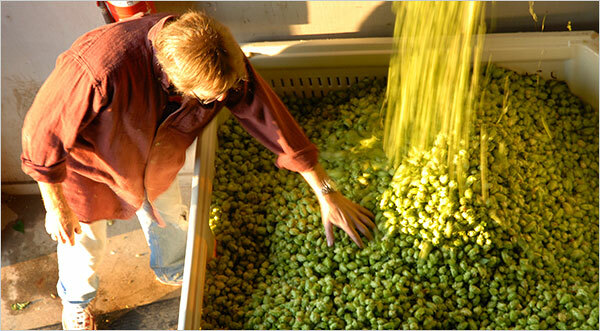 But for the beer geeks, the layered quality of malt and hop, especially later-boil hops, give it quite a high "beer IQ." So for Tuesday, Jubel it is. I may be making a media appearance to talk about winter beers next week. (And by "may" I mean "will"--more next week.) I am thinking of a diverse line-up--that is, not all just winter warmers. I have a few ideas, but I wouldn't want to overlook anything. I think bottled beers will be the preference. I make it to a pub about twice a month. Odd for a beer blogger, I know, but there it is. So generally I try to make the trip count. Last night, I made it down to the Widmer Gasthaus to try the new Collaborator beer--CXI, made with loaves of pumpernickel. I live a lot closer to It's a Beautiful Pizza, where this beer is purportedly also pouring, but I wasn't taking any chances. Go to the source: go to the brewery. The very nice waitress took my order and I settled in with the Blazers game playing overhead. A few minutes later, she returned. CXI was not available, nor would it be all evening. (?) Chagrined and mystified, I ordered an alt. Nice beer, but I've had it dozens of times. So what gives? Why is a beer, barely out a week, not available at the brewery that produced it? And I was even considering a growler! Already cultivating an old man's propensity toward crankiness, this kind of thing is no benefit. The universal symbol of a dead tap. Some days I have no posts planned but hope that by trawling the web I will find something interesting. This is not one of those days. McGonigel's is an Irish-Texas pub that serves good beer and Irish food, but features lots of live, Lone Star music. I couldn't be happier to send out the certification letter and placard to a Houston zip code--and I will, today. Last week I stopped by Belmont Station to pick up a couple hearty ales. The dark and the winter have put me in stout mood, but I found myself in front of the Baltic porters. Belmont has a nice selection. I chose, for reasons obscure to me even at the time, a version from Poland--Żywiec. I knew nothing about Żywiec, and yet a bottle seemed to just find its way into my hand. I am used to understated European lagers. Europe's ancient breweries haven't lost flavor in the way American breweries did--still, decades tend to leave brands faded, as if they were sitting too long in the sun. 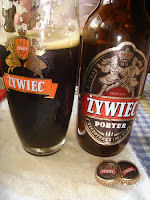 Yet Żywiec poured out impressively--thick but quite effervescent, with a dense mocha head. The aroma coming off it was anything but understated--earthy and slightly sour, malty, molasses-y. The flavor followed vibrant suit, with a cascade of bitter, roasted malts that had the quality of coffee and very dark chocolate. Some beers are so bitter that they start to come back around toward sour. In this way it had the molasses of the nose. It is an amazingly pronounced, aggressive beer, and I loved it. About half-way through my half liter, I started to feel a bit loose. The alcohol doesn't come through--the body's too thick, the malts too black--until you feel it at the base of your skull. Then I checked the label: 9.5%. Hoy! It's a strange beer, with flavors I'm unused to, and yet I really enjoyed it. Sometimes imports take you on a mini-vacation. I could imagine a cold place with lots of root vegetables and dark bread and this beer on the table, maybe with a fire burning cozily off to the side. I know none of you are too coarse to concern yourselves with pricing, but the bottle was between two and three dollars, after having been shipped all the way from Krakow. Given its huge gravity and wondrous, rich flavor, this makes it one of the best deals in beer. You could do far worse and spend far more than picking up a bottle of Żywiec. I may have forgotten to mention that the Pabst Brewing Company is ailing, doomed, and for sale. Despite an effective appeal to 20-somethings on its flagship brand, most of the company's portfolio (Schlitz, Rainier, Old Milwaukee, Olympia) are in swift decline. 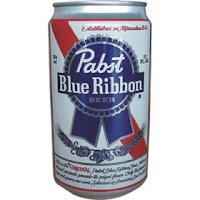 Sadly, Pabst isn't really even a brewery anymore--they sold off the old Milwaukee property in '96 and now contract with MillerCoors to brew their beer. Still, it's the largest independent, American-owned beer company in the US, and many have a soft spot for it. A crowd, you might say. The solution is obvious, right? Crowd-source a purchase! Two ad companies are trying to get enough people to pledge to pool their money (in increments as small as five bucks) to buy the $300 million company. For just pennies, you can own Pabst. Call it the Green Bay Packers model of business. Personally, I wouldn't want the thing. Pabst is in a terrible position, and if the brand survives, it will be as a minor subsidiary of one of those massive beer companies that are now desperately eating their own. Aside from a history, a "brand identity," and a recognizable label, there's not a thing about Pabst that distinguishes it from the 97 other tin-can beer brands out there. With no brewery, no local audience, and no commitment from an owner, the writing's on the wall. Pabst is a sucker's bet. One of my points last year was I thought the 2008 vintage was too hot and young on its release; the first thing I noticed with 2009 is that, while there is the heat of a young high-alcohol beer, it’s not nearly as strong right out of the bottle as the 2008. There’s lots of charred wood and bitter dark chocolate and some vanilla in the bourbon notes—yes, the bourbon is there in the heat, and it’s sticky and thick and wafts up into the nose as you drink. But there’s not a hint of the astringency even though it’s super roasty. The Gnome started off with the citrus taste from the hops. That gave way to the malts; where a sweet toasted caramel flavor developed. As the sweetness faded, the ale finished slightly bitter with a tiny amount of alcohol warmth. The head that remained after the initial burn off left a chunky lacing on the glass. This red ale offers the best of both worlds. A medium bodied malt base has some toasty sweet caramel tastes and a little brown sugar. Balanced by a big hop bitterness. Pine and citrus hop flavors mix perfectly with the malt. Balanced and very drinkable. The 7.5% ABV allows this to be intense, but not over the top. Please follow the links and read the whole reviews. I've just snagged a piece of each. Long, long ago, in a land--well, in this land--it was the case that summer was the primo beer season. Mystifyingly. (As I now know--and probably you do, too--that's when the bulk of beer is sold.) But for beer geeks, the most interesting beers are those that go best with a cold day. For us, extra-pale ales are fine and good, but they can't hold a candle to the meatier, burlier beers that start appearing around Halloween. Fortunately, brewers seem to share this view, and they release scads and scads of specialty beers around this time of year. I have been working my way through some of them, and I'll try to do better about getting up respectable reviews. Today's beer, Elysian Night Owl, a spiced pumpkin ale. Pumpkin ales occupy a class of Rodney-Dangerfield beers along with light fruit ales and chili beers--they don't get no respect. Yet they are popular, and people enjoy seeing them come around each year if for no other reason that to celebrate the change of season. There's nothing about pumpkin that mandates a beer must taste like pumpkin pie, and yet this seems to be the near-universal interpetation of style. A light-bodied beer, usually malted with some Munich or Vienna malts to give it an orangey hue, and a handful of the usual spices--nutmeg, cinnamon, clove. Personally, the style is not for me. I wouldn't mind having an Oktoberfest along with my pumpkin pie, but combining the two seems unnecessary. I took a flyer on Night Owl because 1) the brewery is one of the most trustworthy in the country, 2) it's been getting strong reviews this year, and 3) I haven't had a pumpkin beer in a few years and began to wonder if I'd unfairly maligned the style in my memory. On the positive side, Night Owl is one of the best pumpkin ales I've ever tried. Lesser breweries will suffuse an uninspired beer with spices and call it good. Elysian played down the spice a bit and allowed the malt and squash to come out in the open. As an ingredient, pumpkin is nice--it adds a character not unlike malt, but a bit more bready; I imagine it contributes body as well, but this may just be my mind over-interpreting. The base beer is clean and well-made, if just a touch too light for my taste (though exactly like the other pumpkin ales I've tried). The spices are strong in the nose, but less so on the tongue--they suggest pumpkin pie without feeling the need to get mean about it. I had it with a friend who loves pumpkin beers and he gave it very high marks. This, I think, is the key point: if you like pumpkin ales, you won't find a better example. If you wish you liked them and buy a bottle of Night Owl hoping to be convinced, good luck to you. No matter how good Elysian is, this is still a pumpkin beer. I'd rate it a B+ for style (and declare the style a dud). Hair of the Dog brewer and founder Alan Sprints has concocted a special barrel-aged and bottle conditioned Flemish Red Ale simply named “Michael” to pay tribute to the man who Sprints calls “the most influential beer writer and critic who ever lived.” We must admit, those are hard words with which to argue. I saw the announcement for Michael on Alan's Facebook page, and so I asked him about it. "I have been brewing this beer once a year since 2007; it is made with organic pilsner, Munich and Vienna malts. It is around 6% abv and fermented with the Wyeast Roselare blend. This bottling is a blend of American oak and sherry-cask aged beer from the 2007 brewing. It will be released every year in November. Next year's bottling will be mostly French oak-aged. I hope people compare it with Rodenbach; it is still to early to tell." You can get Michael this Saturday at Hair of the Dog's annual dock sale. Also available: Cherry Adam from the Wood, Fred from the Wood, Doggie Claws, Matt (bourbon and apple brandy barrel-aged sour). To complete the circle, I wanted to mention that I sent BridgePort brewmaster Karl Ockert the results of the two polls I ran on the blog last week. Karl had okay-ed my proposal to poll readers here to see what style of beer they'd like BridgePort to brew for the open slot in the "Big Brews" line next spring. In the first round I polled you on ten styles, and the faves to emerge were 1) big NW red, 2) Old Ale, and 3) Strong Rye. In a run-off, you favored the old ale with a clear plurality of about 40%. The red just nipped the rye for second place. I sent the results to Karl, and he will take them under advisement. Apparently some of the brewers there cotton to a strong lager, though Karl said " I am on the fence but the Rye sounds appealing to me." It was a fun exercise, and I appreciate your votes. I actually think you all are a great cross-section of the target audience for the "Big Brews" line. 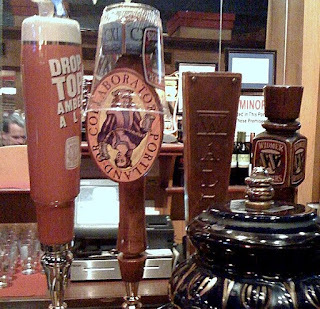 Those types of specialty beers are aimed squarely at the beer geek, as is this blog. 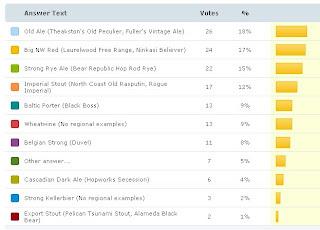 I was surprised to see how poorly some of the original ten fared (Cascadian Dark Ale only got 4% of the vote; wheatwine, which I thought might poll strongly, just 9%). Based on your voting, I'm prepared to predict that any of the top three beers (or the odd-beer out, the imperial stout, which also polled strongly) would sell well. And, since I can't rely on BridgePort to brew the old ale, I took matters into my own hands and whipped up a batch over the weekend. Old Codger, a beer as cranky as its brewer. Dubbed "Eight Malty Nights," the Chocolate Rye beer will be brewed tomorrow, November 10. Rabbi Bradley Greenstein from the Congregation Neveh Shalom will be present to bless the mash and deliver a toast. The beer will be released on the first day of Hanukkah, Dec. 11. To witness the blessing of the mash and take part in the toast, please be at Lompoc Brewing, 3901 A N Williams Ave, Portland on Tuesday, at 7:30 am. 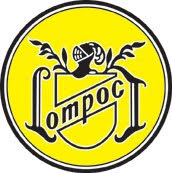 By the way, when did the "New Old Lompoc" (aka "Old Lompoc") become "Lompoc Brewing?" Did I miss something? Good Time to Start a Brewery? Coalition will join an industry that, thanks to Oregon’s brewing pedigree, is sizzling. Coalition is one of 15 breweries or brewpubs — which sell beer made on the premises and food — that will have started operating in Portland between summer 2009 and early 2010. Derek hasrounded up the various breweries slated to open that he knows about (though I remain confused about the fate of Clinton Street Brewing--see Bill for more). While recession-era launches can be difficult, the climate may have benefited Hoyt and other Oregon brewers. For its new pub, the three-year-old 10 Barrel brewery found lease rates were about 40 percent less than what owners would have paid in 2008. Wales’ contracting costs were also 10 percent to 20 percent less than he’d anticipated. Portland is lousy with brewers. Homebrewers, assistant brewers, brewers moving to the brewing mecca. And half of them are harboring secret desires (or not so secret) to open their own places. Perversely, the recession has provided them with a surprising opportunity. Loans are harder to get, but for those who can secure them, opening a brewpub is cheaper now than it has been in years--and maybe cheaper than it will ever be again. That leaves the final question: can even Oregon absorb another 15 breweries? In the abstract, the answer is yes. The market is still growing, and as far as I know, these are all small breweries--their output will be just a fraction of the market. On the other hand, the market has gotten extremely competitive. If a brewery enters the market and their first keg of beer is clean and tasty, they should find an audience. Breweries that come out with bad beer, or even just uninteresting beer, may be dead before they get started. Good time to open a brewery, but still risky. 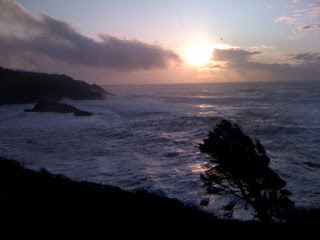 Probably won't affect blogging; I was just looking for an excuse to post the pic. I finally got back to the interview I did with Gary Fish a couple weeks back. I did manage to post some of the "breaking news" tidbits, but none of the interesting historical anecdotes. The most interesting was this following story, where Gary relates how Black Butte Porter became the first beer they distributed in Portland. I had just asked Gary why he thought a dark beer would be a hit--when every other brewery in the state was trying to sell lighter beers. “Honestly, I give all the credit for Black Butte Porter to Jim Kennedy. He was the one who tried the beers and said, ‘Look, everybody’s coming out with light-colored beers, but this is a beer that’s different, and this is a beer that can capture the consumer. And be different. The dark-beer pie is not as big, but you could own the whole thing. We probably would have tried to go with Cascade Golden Ale or Bachelor Bitter. Full Sail Golden Ale was their lead brand, Portland Ale was their lead brand. Everybody was really on the ultra-light side of the color spectrum. Who knows how significant this decision turned out to be. Maybe if Gary had gone with the Golden Deschutes would now be a modest-sized brewery. 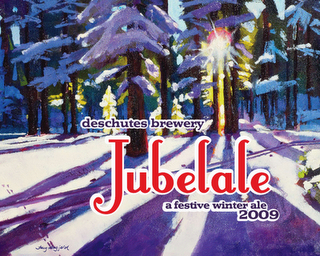 We only know the history as it was--Deschutes got off to a great start with Black Butte, was partly responsible for popularizing dark beers in Oregon, and launched itself on a trajectory to make it one of America's largest craft breweries by 2009. History is a capricious lady. By the way, Jim Kennedy played a major role in helping popularize craft beer in Oregon, too. (He's also the namesake for Hair of the Dog's legendary "Jim.") John Foyston re-printed a couple columns about Jim last month, and they're well worth a read if you're unfamiliar with this piece of Oregon's brewing history. In case you missed it, I posted a poll yesterday to find out which beer you'd like to see BridgePort should make for its Spring "Big Beers" series. I'm shooting for 200-250 votes, and the current total is 144. So please vote now if you haven't. The early returns show three strong contenders (old ale, Big NW red, strong rye) and one more on the outside looking in (imperial stout). The folks over at Pyramid/MacTarnahan's are trying--I'll give them that. They have not let the the Mac's line become just a single product and this year introduced a new line-up of seasonals. All of that is good. They even put out an exotic saison (and exotic not just by MacTarnahan's standards). So definitely an A for effort there. We come now to the critical portion of our review: the names and packaging for the new family of beers: Slingshot Summer Pale (good), Summer Grifter IPA (not good), and now the latest arrival, Winter Humbug'r (oh dear lord). The art is actually very cool, suggestive of graphic novels and dangerous fun. But a grifter is a guy who hustles you out of money--likesay the $8.29 you spent on the six-pack. Would you call a beer Swindler or Cheater? As for Humbug'r, the sense of the lurid is such that--Bug'r, really? I remember the crazy Bobbydazzler of years past, a bizarre Englishism, but harmless enough. One might hope that Humbug'r is a name of similar provenance, but the label convinces you otherwise: a soused lunatic brandishing a sprig of mistletown and leering. And it's called Humbug'r. The beer? It's pretty good. A light porter with a silky, oaty body. Porters and stouts are great winter beers, and I commend Mac's for eschewing another winter warmer. This beer is actually a bit of amalgam, equal parts dry stout, with a slightly burnt, roasted front note, part brown porter, with a pronounced sweet middle, and part sweet stout, with that silky full body. It is a bit on the mild side (a house character, so perhaps appropriate), and on those really bitter December days people might be reaching for the Obsidian instead. But overall, a fine beer. I'd give it a solid B. But since we're giving advice to breweries these days, here's mine. It's nearly 2010. Beers that appear to succeed in the marketplace are those that distinguish themselves with bold flavors. I haven't really seen a line that has succeeded by dint of a clever ad campaign or brand identity, and locals tend to be turned off by anything that looks like it spent too long in a room with a wine-drinking design team. MacTarnahan's seasonal lineup now features a pale, an IPA, and a porter. These are fine beers, and they're perfectly well-made. I just think Mac's needs to come out of the gate with a little more under the hood and a little less focus on packaging. You've hired some great brewers--turn them loose and get out of the way. In my interview with Karl Ockert last week, he mentioned that BridgePort is currently ruminating about their Spring "Big Brews" slot. The Big Brews line is the one that has included Hop Czar (which will be moving to six-packs), Fallen Friar, Stumptown Tart, and Raven Mad. Karl asked me--as he probably asks everyone--what I would suggest. I told him I'd do him one better than that; I'd find out what you would suggest. So below is a poll with a number of styles that I have pre-selected. They include only "big" beers--my rule of thumb was 7% and up. I eliminated styles BridgePort already brews (tripel, double IPA, barleywine), and styles that are pretty broadly brewed or randomly imperialized styles (Imperial Kolsch!). Of course, some of you may have a suggestion that's not here, so please use the write-in category. I'll run this for a few days (until we hit 250 or more) and then we'll winnow it down to 3-4 styles and see if there's a clear fave. You can click through to learn more about the styles at BeerAdvocate, which handily also has beers brewed in those styles. Kellerbier is totally obscure, but it's a hoppy lager generally brewed at weaker strengths--but it can go up to 7%. Some of you will remember Jamie Floyd's wheatwine from Steelhead, but otherwise examples are rare. It's essentially a barleywine made with a large proportion of wheat. I have no idea how much pull your suggestions will have, but Karl ran it past some folks at BridgePort and they're interested in what you think. So please vote! The first wax-dipped bottles of The Abyss will be available for sale in the Portland and Bend Brew Pubs on Tuesday, Nov. 3rd. These early sales are limited to six bottles per person. The first 48 bottle customers will get bottles signed by Deschutes Brewmaster Larry Sidor. The party starts in Portland at 2 pm and in Bend at 5:30 pm. Also of note to you smaller folks. I got a black, long-sleeve t-shirt in the mail from Deschutes. (As always, I'm high on swag.) It's got a line drawing of a bottle of the Abyss on it, but it is sadly a medium. (And, truth be told, I don't wear t-shirts all that much anymore.) The first person to email me with their home address gets it. One of the best things about living in Oregon is the variety. Yesterday I posted a piece talking about four new brewery/pub openings slated for this year--make that five if you include Coalition. Nearly every week a new beer is released, and if you include brewpub-only beers, it's more like a dozens every week. I constantly have a backlog of beers I mean to try, and let's not even get into the question of national and international offerings. Another of the many interesting things to emerge from that conversation with Karl Ockert was a comment he made about the "novelty curve." It arose when we were talking about the question of selling BridgePort IPA, an ancient beer by craft brewing's standards, one released way back in 1996. It is truly one of the best beers brewed anywhere in America, and one of my all-time favorites. But how often do I buy a sixer? Once a year, twice? (I have it in restaurants more often because it's often the pick of a small litter.) The beer hasn't lost any of its interest to me, and yet, because it's a familiar old standby, I usually opt for something I haven't tried--and there's almost always something I haven't tried. Certainly, BridgePort IPA has earned some loyalty--according to Karl, it's still the best-selling IPA in Oregon (though no doubt their slice of the total pie has declined since '96). When you are an established brewery, there's always a wave of novelty coming at you. Since BridgePort IPA was released, great breweries like Laurelwood, Ninkasi, Roots, Double Mountain, Hopworks have entered the Portland market, all bringing their own IPAs along. With each one, BridgePort still had their same-old, same-old, never mind that it continued to be one of the best on the market. Looking forward, there will be scores more breweries opening in the next fifty years. And with each one, BridgePort will have to continue to coax consumers and retailers back to theirs. As markets mature, this novelty curve will come with a sharp edge. 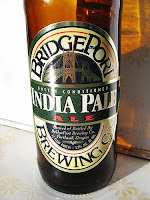 I don't expect BridgePort IPA to go away anytime soon, but it's a good example because it is so beloved. As consumers, we love new beers, but in the long run, we love some of the old ones even more. As the market gets more crowded, we'll have to watch out that benign neglect doesn't nip some of our old faves. Recession, what recession? Apparently someone's getting loans. 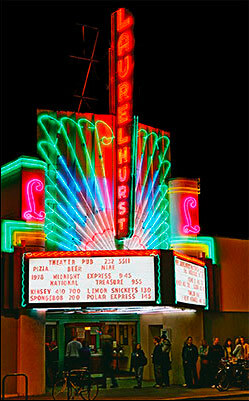 We have news of three separate openings. "Ok, so here’s the details on Rivergate Brewing: North End Pub. I am one of the owners of the new North End Pub on Lombard. Yes, we are going to be as family friendly as OLCC will let us be. We hope to be open by about November the 10th; we may have to open without beer or alcohol--we will have to see when the OLCC gets the permit issued, Just waiting on them. We are currently trying to get the dining room repainted. Yes it has been a HERCULEAN task getting things cleaned up; the building has been vacant for about 2 years. We hauled 14 yards of debris out of the parking lot alone. I will be planning on brewing some of our own beers in the future, just not happening at the start. I am NOT a hop head, don’t expect big IPA’s from me. I am an ale and Kolsch fan and have been known to dabble in some darker beers just for fun. We are looking forward to seeing as many people as we can when were open. Sorry no more information has leaked out--lots of people have been stopping by and talking to us, so many in fact we have started locking ourselves in so we can get some work done. [editor's note: sorry! ]I have hired several excellent cooks to run the kitchen and are working on a great menu, trying to keep it local fresh and flavorful. Hope this helps. Thanks for all the kind words, and we hope to live up to the expectations. Yesterday, cruising north on 28th Avenue, I happened to see what I thought would become breaking news: a new alehouse. It's walking distance from my house, and I was thinking--what good fortune I have that 1) these places are opening so near to me, and 2) I get to break the news. Umm, no. Apparently everyone in the city knows about Spints but me. (Sample from a cursory Google search: Portland Food and Drink (1), Portland Food and Drink (2), Willamette Week, and It's Pub Night. Oh, and they have a website and Facebook page, too.) Looks like it is going to follow Seattle's lead and become (at last!) a high-end restaurant with cuisine designed to be paired with food beer. A real McCoy gastropub. It would be hard to miss the coming of Prost, which is the newest link in the Seattle-based chain, not to mention the newest member of North Mississippi's food scene. The owners completely remodeled an indistinct, tumble-down building on the corner at Skidmore, producing a Victorian gem. The focus is German beer, and all the taps are German imports. From the chatter I've seen on the Brew Crew's listserve, the taps are rather generic. Prost's real virtue lies in the formerly vacant lot just adjacent to the pub. It is now filled with food carts, and Prost is acting as the indoor dining room. Grab a plate of Pad Thai, head inside with it and get a pint of Bitburger. You could definitely find a worse pairing. My eagle-eyed neighbor Lindsey spotted signage for a new brewpub near NE 28th and Glisan: Migration Brewing. Pretty soon you'll be able to do an alphabetical pub crawl up 28th. Coalition at Ankeny, Holman's at Burnside, Beulahland at Couch, we need stuff at Davis and Everett, then there's Spints at Flanders and Migration at Glisan. Neighbor? No wonder we're pulling them in. Apparently Bill's a Buckmanite, too. Good stuff to keep us warm and happy this winter.